The professional grade and easy to use Press-N-Snap setting tool from Hoover Industries is a must have the for the canvas fabricator. This is a complete set containing the tool and all the dies you need to set snaps . Rubber ring holds one part of the fastener for one handed operation. It is made from a lightweight, yet very durable heat-treated cast aluminum, and it comes complete with four different dies. Installing snaps is now a very simple task that saves you time and money. Simply place the fabric between the dies and press/squeeze the handle. Press-n-Snap is capable of setting numerous brands of fasteners by a simple change of the dies. Cap die (for the top snap button), Socket Die (for the snap socket), Stud die (for the snap stud), Eyelet die (for the snap eyelet) Total of 4 dies. Grommet dies are also available and sold separately for the Press-N-Snap Tool. It comes with 2 sets of dies. One for setting snaps and another set for setting studs onto cloth. Q: Of the many projects I have to complete one is repair of 2 boat tops with existing snaps What size snaps do the included dies work with ? 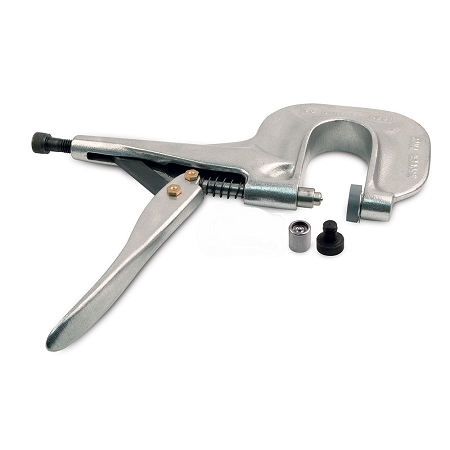 The Press-N-Snap Setting Tool comes with Line 24 snap and stud dies. Line 24 snaps are used on boat tops 99.9% of the time. Just a heads up, we are out but have a shipment coming in on Tuesday June 27. Q: What size is it size 12x9x4 ? weigh two and half lbs ? The tool weights 1.55 lbs. 12" long, 5.5" wide, .9" thick at it's widest part. Yes we do. Drop by anytime. We have 2 spur grommet dies that work with our Press-N-Snap tool. #0 - 9/32" & #1 - 13/32"